FINALLY A TRUE Horsepower Muffler. Designed around the 2nd law of thermodynamics called “Entrophee” Energy. This New Muffler will get you the DB reading you want (under 95 DB). Helps you increase your power over Flowmasters as well as all the rest. It’s even 2 lbs. lighter than the Flowmaster and the same weight as the Super Trapp. No maintenance either. Proven and tested. 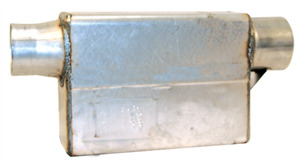 The 1997 thru 2002 Daytona 500 winners used this type of Muffler. They Are Much, Much Smaller For Easy Installation And Won’t Back Fire When You Let Off The Throttle. Shavers Dyno Says Only 4 Hp Loss Over Open Headers.